It was amazing! Arriving to Urumqi after cycling there all the way from the Netherlands. It was quite a huge milestone for us. But it was also a bit daunting because during the last days of the year we’d had some deep conversations about what next. The plan was clear but the feelings not so much. 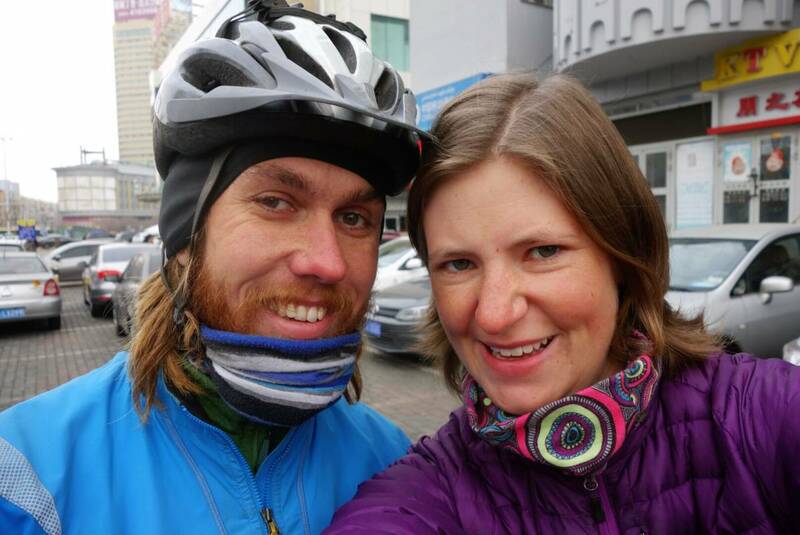 We cycled into Urumqi knowing that we would celebrate New Year’s Eve together and then would split up temporarily. 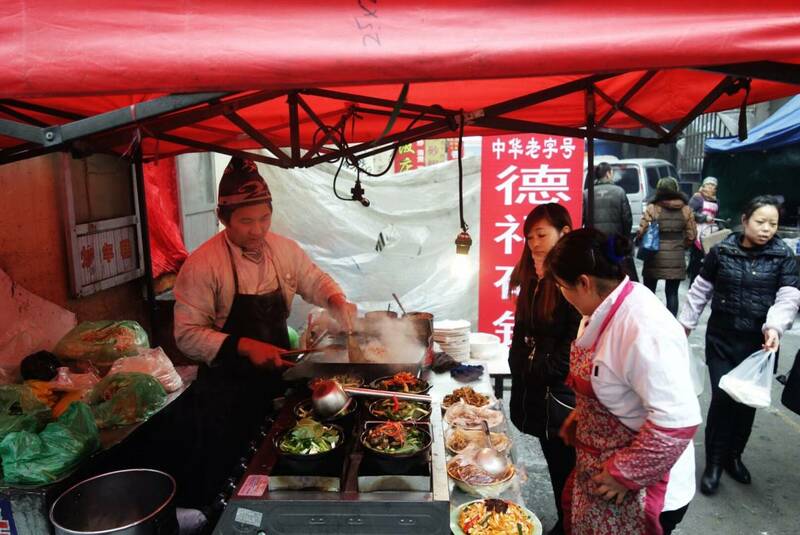 This is my story from Urumqi to Ulaanbaatar – doing it different part 1. It didn’t take long or Martin was in the mode to prepare for his solo adventure through Mongolia in the heart of winter. I was still uhming and ahing… What was I to do? Although the conversation we had on the road was forced by the circumstances, it was the truth. I don’t want to cycle through this damn cold anymore. It has been hard and we were both sad because we both really wanted to do this together, but I couldn’t stand the cold mornings, the cold evenings, the frozen water and the slippery roads anymore. Enough is enough. It is too extreme and not what I had in mind planning our big journey. We have been traveling for quite a long time and I was longing for a place for myself a little bit. But where to find this and how can I spend the time in between meeting each other again useful? I really understand Martin for wanting to pursue his dream. He has always wanted to travel through Mongolia, so have I, but for me the circumstances are also important. It gave him an extra challenge to do it now and not hold back because of the elements and because of wrong timing. I very much respect him for that. For pushing on when it is difficult and for going for his goals even though timing is not on his hand. I felt a bit lost in Urumqi. It is actually quite a nice city. We did some looking around and went to the bazar. We had planned to do a lot of site seeing, but site seeing isn’t really our thing. We find the places in between more interesting somehow and travel in a way that is different from others we sometimes feel. Urumqi was also very much militarized with armed military and police on a lot of corners. Big tanks, metal detectors and controls everywhere. You needed to be registered to get into a petrol station. This all due to the unrest between the Uyghurs and the Han Chinese and the bombing that had taken place earlier in the year at the train station. It was interesting to see, but I really don’t like that people have to live that way. Anyway, I finally knew what to do. I was going to go to the south of China, volunteer with English corners to help students practice English and extend my visa. Then after a months time I would head back up to Mongolia with the train to meet Martin again. I booked my tickets for the train and dropped Isaba off at the train station. 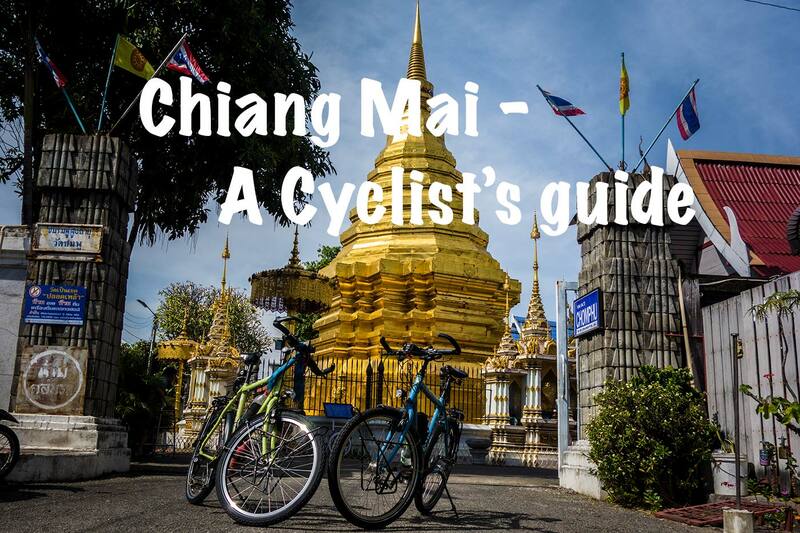 I will also give some practical tips and price indicators in this post if anyone wants to try the same trip in the future with a bicycle. I was really not looking forward to all the logistics involved (it is really easier to cycle with a bicycle than take it on a train). 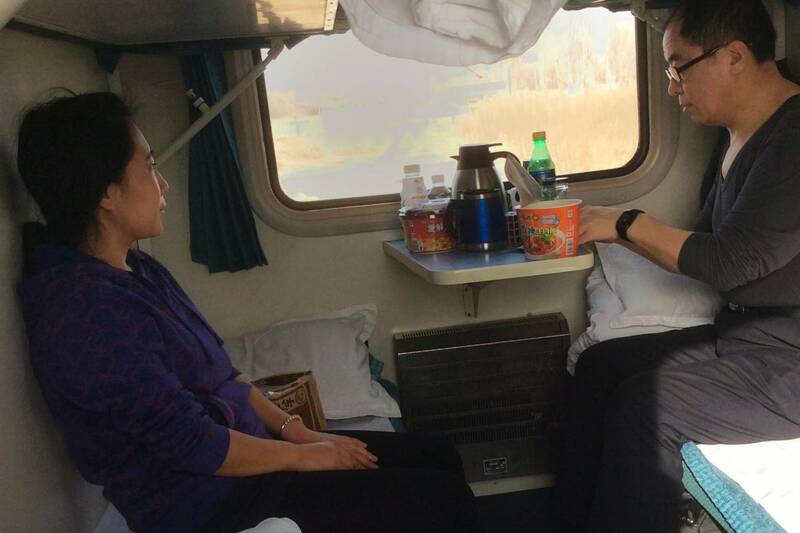 The train ticket was $86 for a hard sleeper to Hohhot, (booked via www.travelchinaguide.com, they charge a $7 service fee) and I needed to pay an extra CNY155 (about $25) for my bicycle on the train. The bike needed to be dropped off the day before to be in Hohhot at the same time as me. The building to drop off luggage is on the left hand side of the train station in Urumqi. I had planned to go to Hohhot in the north and leave my bicycle there while I would travel south and then pick it up on the way back. Well, Martin left Urumqi with Mojo and I felt really sad. It was a disappointment to myself to not cycle on. But this also was the hardest decision for me to make. It would have been easier just struggling on in the cold. 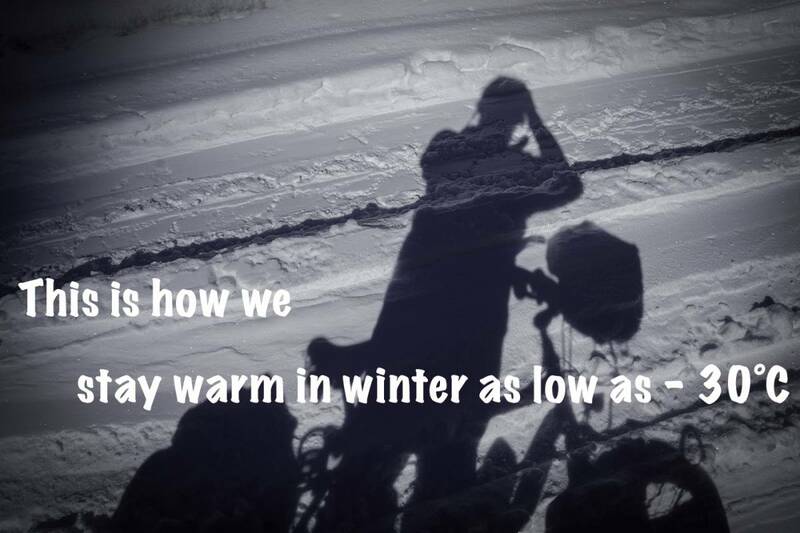 The cycling has become our comfort zone. But I really needed to stop and make the decision that cycling in the cold is not what I want and the extremity of the circumstances in Mongolia are never what I had in mind in the first place. 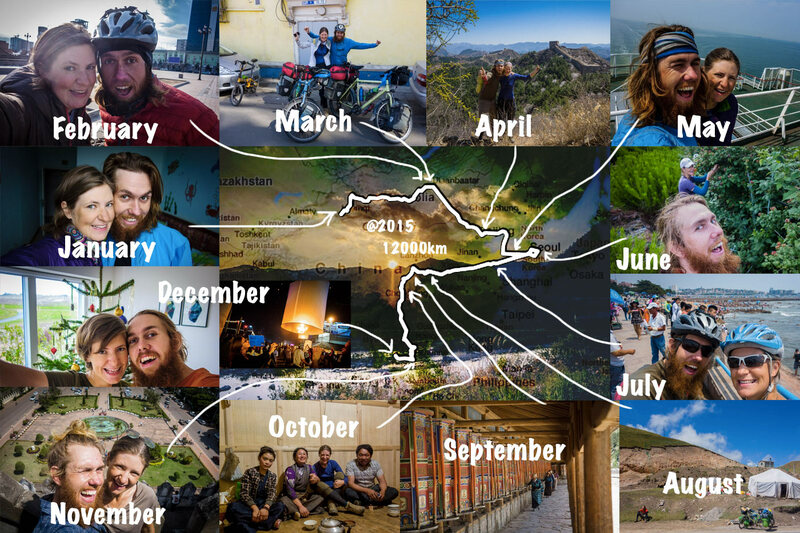 Not even the extremities that I had already cycled through and camped in in Kazakhstan and China. So I had already achieved a lot for myself. The next day luckily I had an early departure, I got a ride from the hostel to the train station and there was a porter to help me with my two huge bags! It was almost impossible to carry with my arms what is usual on the bicycle… I found my train, waited for two hours because I was very early and got on. 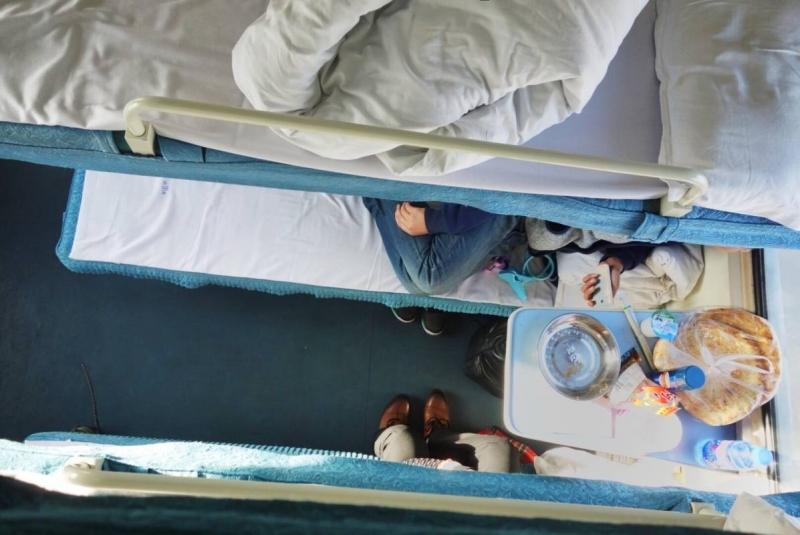 I had the top bunk of three bunks in a hard sleeper section. It was very warm, although not very crowded luckily. I had an okay time also talking a little bit with people from the neighboring section who were from Inner Mongolia, the Chinese province I was heading to. The train ride took 32 hours. For me that is quite a long time to be inside at the moment and not go anywhere. I was getting restless and it was really warm in the train so I went for a walk up and down the train. After this train there were three more trains and a bus waiting for me. I was realizing that I have really changed in the last eleven months. I really appreciate the outdoors, I love the feeling of being outside. It is very special that the sun goes up and the sun goes down every day and being on the move at a slow pace brings a lot of peace of mind. Because I had nowhere to go on the train and there was no internet to distract me I had very nice thoughts. I also realized that I didn’t really want to go to the warmth. I was just fooling myself with an image, a story in my mind, that it would all be easier and I was not looking forward to the logistics and all the traveling, backtracking and then going the same way again. Spring will come after winter and after spring summer will come. This realization was further made when I was in Hohhot. I was actually really interested in Mongolia and felt that volunteering in a country as Mongolia would be more appreciated than working with Chinese business students on their English. It sounds a bit harsh but it just felt like I needed to go to Mongolia to work things out for myself and find the right way for me. We would be cycling in China anyway later in the year. It might seem that I was missing Martin, but the time apart would be exactly the same. There is an added bonus though that it is easier to stay in touch while I am in the same country and if anything might happen it will be easier to find a solution from the same country. This is something which gives us both some peace of mind while he is in the middle of nowhere in Western Mongolia. In part 2 I will tell you more about Hohhot and how I made my way to Ulaanbaatar. Hoi Susanne, mooi stuk over je gedachten tijdens het fietsen en de treinreis. Veel plezier in Mongolië. Dank je Marit! Mongolia was echt super en het is een goede keuze geweest. Hoi Susanne, lijkt me een prettige afwisseling! Een beslissing waarbij je luistert naar jezelf is altijd goed. Heel veel plezier op jullie avontuur nog! Inderdaad een fijne afwisseling. Nu stappen we weer op de fiets. Was fijn om even wat andere dingen te doen en een ander ritme te hebben. We gaan weer richting China! Wat een kans, dit is het moment om (eindelijk..) te doen wat je hart je ingeeft. Zo’n tijd zo dichtbij met elkaar leven vraagt om even niet. Althans zo zou het bij mij werken. Misschien is er meer aan de hand, maar opsplitsen lijkt een goede optie. Of het een sjieke keuze is… dat vind ik eigenlijk niet. Maar goed, wie ben ik. Bij min zoveel dag in dag uit zou ik het ook niet lang uithouden, wie wel eigenlijk? Dus doe wat je wilt, echt wilt. Pak die kans! (Hij doet het ook..!) Wijsheid gewenst! Dank je Yvon. Het is goed geweest om even iets anders te doen en de winter was hard. Op deze manier kunnen we beide onze doelen behalen wat voor ons beide belangrijk is. Nu stappen we weer op de fiets richting China!